Subscribing Tech At Hand Dot Net will allow you to automatically receive every new article whenever they are published. This provides a great deal of convenience for you, because you won’t even have to visit this Website to access all the latest articles or news. The benefit of this is that it will save you a lot of time and effort; All of the new content on this site will be delivered to you directly for free and all you have to do is to read it at your own leisure. RSS Feed Subscriptions. New articles will be sent to a web feed reader. Email Subscriptions. New articles will be sent directly to your email inbox. What is a ‘RSS Feed Reader’ and How Can I Use it? RSS feeds are document formats which allow you to keep up to date with content on all blogs and some websites you come across while surfing the net. When you subscribe to an RSS feed, the feed reader will check the website you subscribe to for new content. If there are any new articles, they will be displayed within the reader itself. Sign up for a Free Feedreader (I recommend Google Reader or Bloglines). Come back to this page and click on this link to subscribe to Tech At Hand Dot Net . And you’re done! Remember to check your feed reader daily to see if new articles from Tech At Hand Dot Net has been published. All the published articles from Tech At Hand Dot Net will show up automatically in your feed reader. If you’ll like to, start subscribing to other blogs or websites you fancy as well. Can I Choose to Subscribe Via Email Instead? 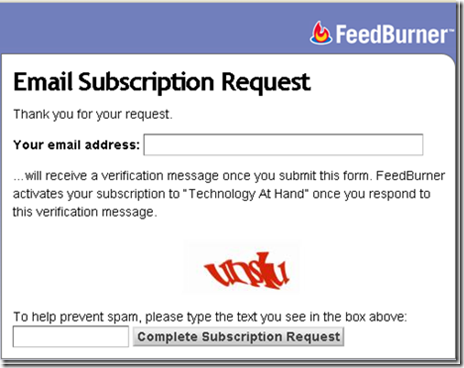 Fill in a legitimate email address and enter the captcha as it is displayed on the page. Don’t worry if you get an error message while typing in the captcha the first time. It happens occasionally. Just type in the captcha one more time. Once you see the screen below, visit your email inbox to verify your email address. Be sure to check your spam folder if you don’t receive any verification emails. You’ll only receive one email every day regardless of the number of articles published. For example, if I publish 5 articles, you’ll get them all in one email newsletter. This will be the same even if I publish only one article in a day. 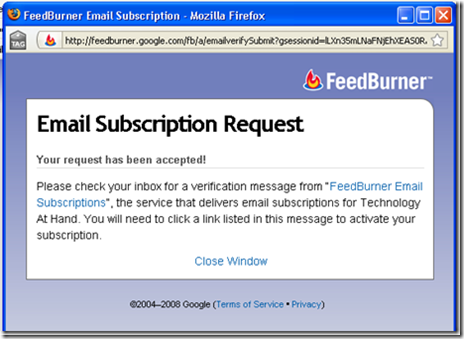 All email subscriptions are managed by Feedburner.com and you can unsubscribe anytime with a click of a mouse. For your convenience, instructions for unsubscribing are included in each email newsletter as well. Please be assured that your email will kept in the strictest confidence and will never be used for spam, so please use one that you check regularly. If you have any trouble subscribing to Tech At Hand Dot Net, please send me an email. I’ll be happy to help in any way possible.